Homemade fruit snacks are at the heart of the story I’m about to share. It’s a story about being that mom. Sometimes I hate being that mom. You know, the mom who thinks her kid deserves only truly healthy fruit snacks. Well, I don’t really hate being that mom. But I do hate being the mom that tries to hide her look of fear and disgust as an innocent (and very kind) parent or child offers my child an artificial, store-bought, and full of fake dyes fruit snack. I grit my teeth and politely push a “thank you” from my lips while in my head I’m screaming: DON’T FEED THAT TO MY CHILD!!!! Yeah, I don’t really like being that mom. I try not to go too crazy… after all, I know my kids gets real food 99% of the time… so the rare non homemade fruit snack or handful of gold fish crackers won’t kill her. But still. Sundays are always the worse as we head off to church and then my parents’ home. I practice my deep breathing, picture lovely things, and wish I had a better alternative to the processed offerings that seem to come at every angle. Why can’t I just find a healthy fruit snack!?! Fear not. I have found it. My healthy homemade fruit snack. Not too long ago, Heather (aka: The Mommypotamus) posted a gem of a recipe for easy sour gummies. I made them. I loved them. And have since been inspired to create my own version of healthy homemade fruit snacks. Why are these homemade fruit snacks healthy? Sweetened only with a little bit of honey, and colored by the fruit themselves, these snacks are simple, delicious, and very kid (and crazy mom) friendly. Blueberry is my favorite (which is saying something because it’s my least favorite berry of the bunch). Combined with the lemon juice… oh boy. They are good. Yes, these yummy treats are a truly healthy fruit snack. Note: I like to keep these homemade fruit snacks in my fridge (I love cold things! ), but they do transport and keep nicely at room temperature. 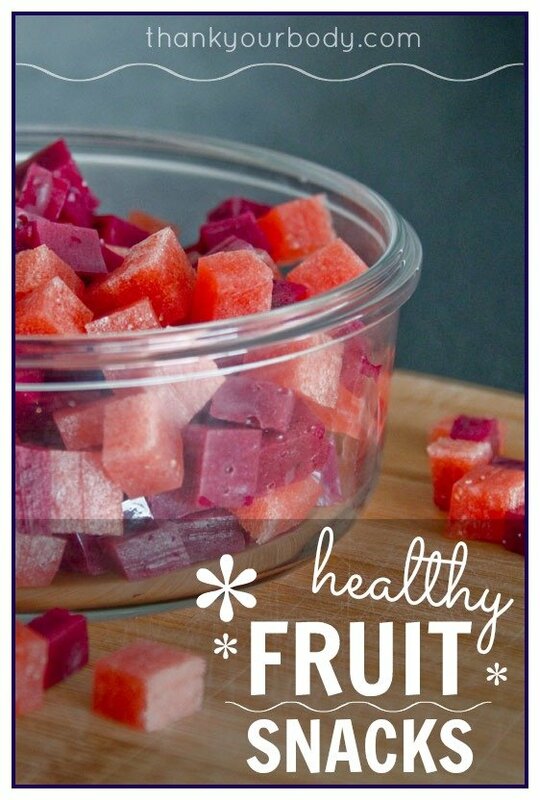 Tell me… Do you love making healthy homemade fruit snacks? How do you help your kids eat real food? A healthy homemade fruit snack… who knew it could be so easy?